It's Friday and a new Dare is up. 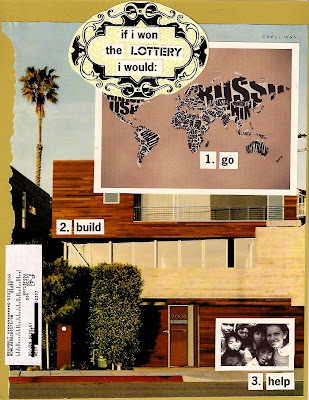 What would you do if you won the lottery? At first this topic had me thinking about LOST (which happens any time I hear about airplanes or time travel or ... the lottery.) Anyway, I knew what my top three things would be and then I asked Bo what his were and surprisingly (or not) they were the same. We'd build the modern/pre-fab/green house of our dreams. Maybe in California. And travel all around the world. And help kids. In some way. And having these ideas is all just fine, I know, but the trick is finding little things you can do to help someone in the meantime. You know, until you win the lotto. ah, I'll have to come play along! 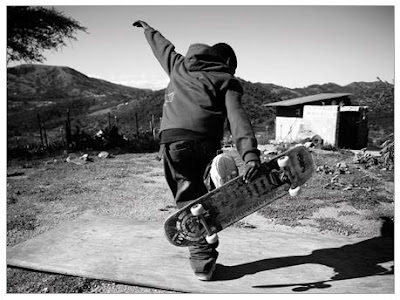 And you know I like the skater pic and Toms-Elements shoe thing-very cool! Wow, babe! That layout is killer cool and amazing! Very inspiring! wow, i LOVE this challenge and your design and i especially love your choices if you won the lottery. you have such a lovely heart. i think i would be right there with you, going + serving! Well gosh so much i would do lol! Very cool and i must agree it is easy to get caught up in our own mess. I always tell myself someone out there has it worse and no matter what everyone should remember that and help in anyway they can. Wish more people had dreams like you, way to be!